Have you been losing money in this bull market? If you answer yes : Then read on. You need to quickly do something about it. If you answer no : Then skip this article. Congratulations, you are doing something right. Stock markets all around the world have also shot up tremendously. Some are even making all time highs! If your account is down in this big worldwide bull run, you certainly need to quickly turn this situation around. Here are some valuable tips to solve your problem. Trading or investing against the trend is perhaps the number 1 account killer for most stock market participants. If you want to make money in the stock market, you MUST buy stocks that are in an uptrend. Stay away from stocks that are in a downtrend. There are only going to go lower. Some people really like to bottom fish. They reason that it is better to buy a stock when it is cheaper. Trust me, it never pays to play a stock that is in a downtrend. They just keep going lower and lower and lower. I'm going to show you an extreme example. 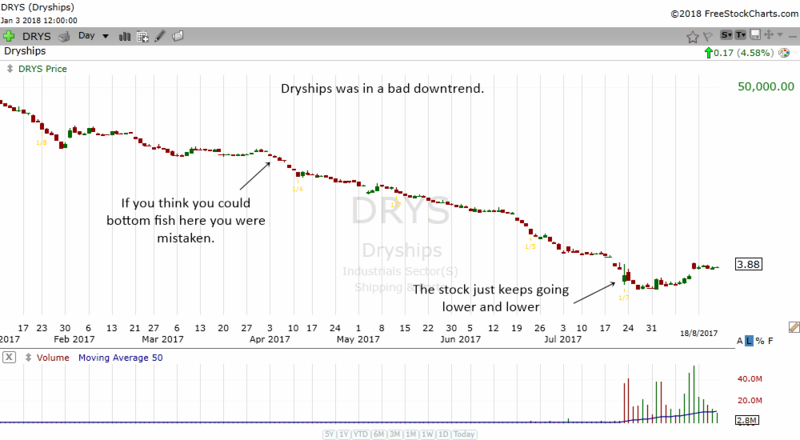 The chart below is the stock chart of a stock called Dryships. Once upon a time the stock was around $800,000. Today it is $3.88. No, its not a typo mistake. The company did many reverse stock splits which was why the previous price was so big. But even without the splits, you can imagine how much the stock has fallen. Dryships was in a very very bad downtrend. If you thought you could bottom fish this stock you were mistaken. The stock kept going lower and lower. Okay, at this moment you might be wondering what is a downtrend. It's a bit hard to explain in this article, but you will notice the stock going from the upper left to the lower right. Negative 45 degrees. Going downhill. Now I'm going to show you another stock that looks exactly the opposite of Dryships. The chart above is non other than Apple. See how different Apple is from Dryships. The stock kept going higher and higher because it is in an uptrend. Okay, once again you may ask, what is an uptrend? Basically the stock moves from the lower left to the upper right. It looks like a + 45 degrees angle. Picture going up a nice hill or mountain. Yes, that is the kind of stocks you want to be trading or investing. Stocks that are in an uptrend and going to go higher will usually stay above their rising 20 MA, rising 50 MA and rising 200 MA. 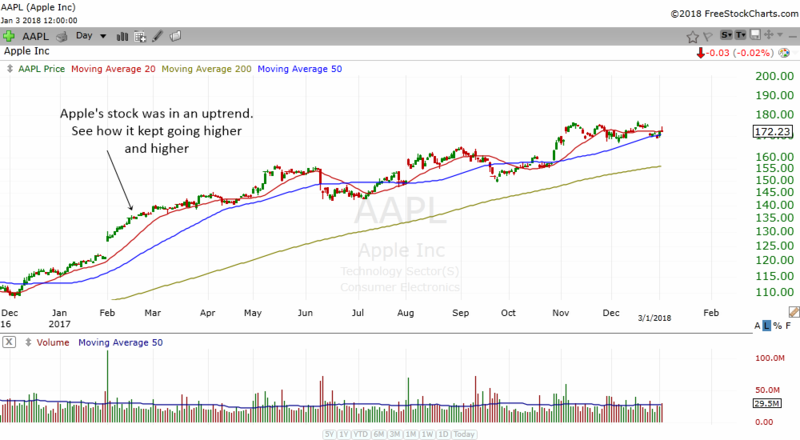 Take a look at the chart of Apple above. Those red lines, blue lines and yellow lines are the moving averages. Wait a minute, what about sideways trend? Well, sideways trend happens when the stock is going nowhere. The stock just trades sideways for a long period of time. If you buy these stocks, you will waste a lot of time being stuck in the stock. There are plenty of other stocks that are making uptrends. The 4 stock market stages are very closely related to trends of the market. Every stock, every index and every financial instrument in the market will go through a cycle. It is repeatable and therefore a trader or investor can anticipate what a stock is likely to do. 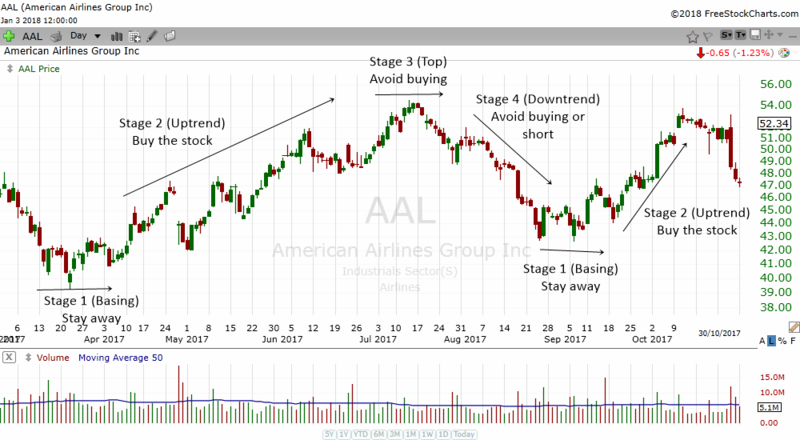 The chart of AAL above shows how this stock completed one cycle. As a trader or investor, you will make money if you buy stocks that are in a Stage 2. Forget about trying to bottom fish. It is far better to buy a stock that is in an uptrend. That way, you are trading with the trend rather than against the trend. Trading and Investing strategies are the keys to consistent profits in the market. If you do not have a plan on how to tackle the stock market, you are likely to fail. Strategies show you what stocks to select, when to enter, where to take a loss and where to take your profits off the table. It is very obvious why the people in the first category fail. Without a road map or plan, they just buy any stock that comes to mind. In the end, they are pouring good money into the drain. The second category of people know the importance of having a plan. Their problem is they try to do too much. They try this strategy and that strategy and then another strategy the next day. It is great to know 10 stock market strategies. But do you really need so many to make money in the stock market? You'll probably end up confusing yourself. Pick 2-3 strategies and MASTER them. All you need is a few strategies that you know very well to make money in the stock market. You repeat it again and again until you can bring in money like clockwork. There's also another benefit of mastering a few strategies. You will be very familiar with the strategy. You will know the ins and outs of the strategy. You will know which are the best candidates and which candidates are lousy ones. If you would like to learn some trading strategies, hop over to the Trading Strategy page. Did you know that one of the biggest reasons for trading losses is over trading? When you learn a trading strategy, it seems like financial freedom. Then you start to notice there are lots of stocks that fit the criteria for your trading/investing strategy. In your eagerness to make money, you enter into many many stocks. At the end of the day or week or month, the winnings from the 2 positive position are irrelevant. That's because the other unnecessary stocks that you played has drag your account lower. There is no reason to take lots of unnecessary trades. You only need a few trades to grow your account. In your eagerness to make money, you entered into many trading positions. This is what we call "OVER TRADING". All this can be overcome if you are SELECTIVE and PATIENT in choosing stocks to play. How do you know what is the right amount of trades you need to do? Well, it really depends on your trading/investing strategy. Study the amount of past winners that happen within a period of time. If you notice that your swing trading strategy gives you only 3 nice trades per week, then stick with 3 trades per week. If you notice that your day trading strategy gives you only 3 nice trades per day, then trade no more than 3 trades. Don't do the unnecessary work that is not required. Is technical analysis better or fundamental analysis better? Debates rage on but there will be no conclusive answer. What this means is you should use fundamental analysis to find stocks to invest in or trade. But you should use technical analysis to time your ENTRY, EXIT and STOP LOSS. Technical analysis is not the enemy of the fundamental analysis camp. In fact they complement each other. Like ice cream and strawberry. Later I will show you two very good books you can read to master technical analysis and fundamental analysis. They are extremely valuable and you should read them. Did you know there are good times to buy stocks and bad times to buy stocks? The stock market works like a traffic light, my friends. When you approach a traffic light, there are 3 things you will do. If the traffic light is yellow, you press the pedal hard and drive faster (just kidding). You should slow down and get ready to stop. A road with many vehicles can be a chaos. Imagine there is no traffic light in your city. How would you get from one place to another safely? The reason driving is relatively safe and orderly is because all of us are trained to obey traffic lights. Even the most impatient driver will usually stop when the lights are red. If the traffic lights work so well in real life, why don't we employ this principle into trading? Just like traffic lights in real life, some rules are very clear (green or red). Some rules are there to help you to be cautious (yellow light). As I said, there are good times and bad times to buy stocks for short term trading. I have listed them conveniently in one place for you. Check it out. The 7 Best Times To Buy Stocks For Short Term Trading. If you are a trader that likes to swing trade, then the article above is just the right one for you. If you wish to learn about the markets, you should read a good stock market commentary. How do you know which one is a good stock market commentary? The last bullet point is perhaps one of the most important. If a website or blog shouts out something like "Make $50,000 a month! ", then be very careful. I think you are smart enough to know what is marketing hype. As you surf all over the internet looking for different stock market commentaries, stock market analysis etc etc, you will notice some of the good ones and some of the bad ones. Right here at Dstockmarket.com I actually do a Daily Stock Market Analysis. I analyze the US stock market and also other things like commodities, bitcoin and other indexes around the world. Many have found it useful. In the past, I used to write analysis on the US stock market. Then I stopped. One day when I check my email, I notice there was a guy in US who emailed me asking why I stopped writing. He told me that my analysis are quite accurate. Up till then, I did not know that my work had some impact on others. Today, I know that if you have something that you are passionate about and if you share it with passion, some one somewhere will benefit from it. That really gives me a lot of pleasure. Books have always been a source of knowledge. Today, there are plenty of trading books being written. How do you know which ones are good and which ones are just a waste of money? One of the great ways to know whether an investing book or trading book is good is to check out Amazon's rating. Go to the website, type in the name of the book. If it is 4 stars and above, then you know that it is of value. Read the reviews on Amazon too. You can often get a glimpse of the book through the reviews. Technical Analysis Of The Financial Markets is the best book I have read on technical analysis. It is very easy to comprehend and it takes you from basic to advanced technical concept in a step by step manner. By the end of the book, you feel like you have all the essential technical analysis that you need. How to Make Money In Stocks is the best book I have ever read on selecting stocks using Fundamental Analysis. The writer studied plenty of big winners over the years and summarized them into an easy to remember formula to find big winners. Not only that, he also teaches you how to combine Fundamental Analysis with Technical Analysis to find winning stocks that will go up 100%, 200 % and sometimes 500% and more. You will learn how to spot stocks like Apple, Microsoft, Google and many other big winners over the years. Finally, Market Wizards is the best book I have ever read about the greatest traders in the world. It is a collection of interviews on some of the top traders that have made hundred of millions of dollars in the financial markets. Reading about their humble beginnings, their rise, their failure and their success really inspires me to be like them. If you read these 3 books, you will have all your bases covered. You will have knowledge on technical analysis. You will have knowledge on fundamental analysis and you will learn about the psychology and winning attitude of the greatest traders in the world. 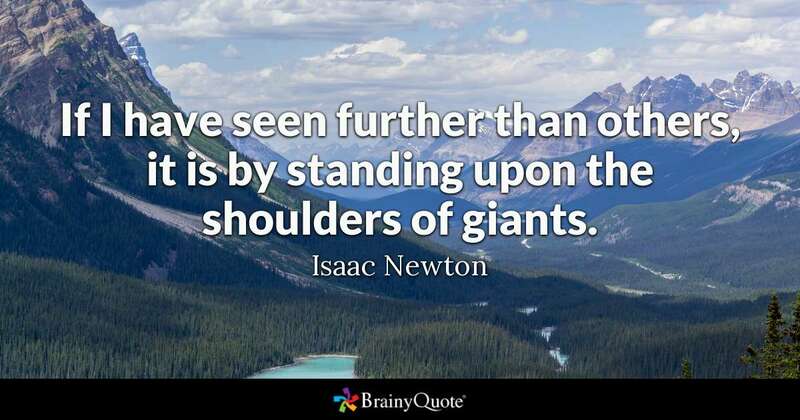 It is once said "If I have seen further than others, it is by standing upon the shoulders of giants". We might not be able to meet some of the greatest investors or traders in person. But books by them or about them will still allow us to learn from these giants. Perhaps someday we might be as great as them. This is an often repeated advice on blogs and books. Have a stop loss they say. Before you brush it off as another routine advice, let me remind you of the implications of not having a stop loss. The chart above is the monthly chart of the S&P 500 Index. 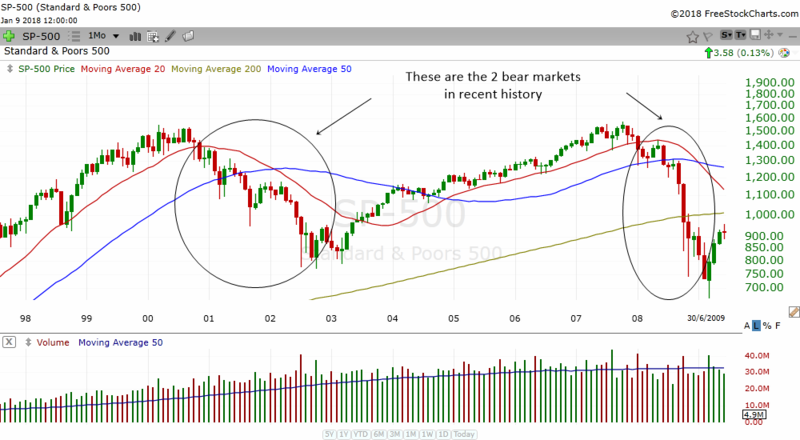 The circled areas are the bear markets in recent history. If you are new to the stock market, you will not have experienced any of this devastating market. We only have a rising market all these years. When the stock market collapsed in these bear markets, investors lost millions and billions in the stock market. Businesses closed shop. Unemployment hit extremely high levels especially after the 2008 crash. Many investors were burned in the stock market. If only they had a stop loss. If only they had a stop loss, their loss will be capped at 20%. If only they had a stop loss, their loss will be capped at $200,000 instead of $1 Million. Stop losses are important because they preserve your capital. From my personal experience, the trades that make the most money are the ones that work out almost immediately. When you are wrong in your judgement, your account will let you know by going into the red. If your judgment is correct, it will go into the green. But oh...we are a stubborn lot. Because a decision reflects our intelligence in choosing stocks, we often stick to the stock in the hopes it would go back up. Sometimes it does but most of the time it won't. A stop loss will act to counter our stubborn resolve. If the stock drops below your stop loss point, it tells you that your judgment is wrong. Better to take a small loss than a big one. Here is how to get the most out of your trading/investing losses. From now on, every time you lose money in a stock, write down the reasons. Soon you will find a pattern that keeps on repeating. We do not really know who is the source of the quote but some attribute it to Albert Einstein. What this quote means is, "if you want different results, don't do the same thing". Or in the context of the stock market, "if you are losing money, you should do something different from what you are doing now". Once you have analyzed why you lost money, avoid doing the same thing again. These are really valuable tips. Trading and investing should be business like. We need to have a plan, follow rules and analyze our business results. Most people will spend a ton of time planning and executing their business plans. But the same people will not spend much time thinking about their trading and investments. Let's work hard and change our habits. Let's make this year a fruitful one!